I need to say that to fully understand the shape of a bridge you need yourself to play the instrument good enough to be able to feel under your bow the differences between one shape of bridge and another or, if you don't, having somebody who does to tell you what she or he feels. However, by looking at the different models bearing in mind how mechanical waves propagate you get a pretty good idea of what happens in each of them. Let's start! 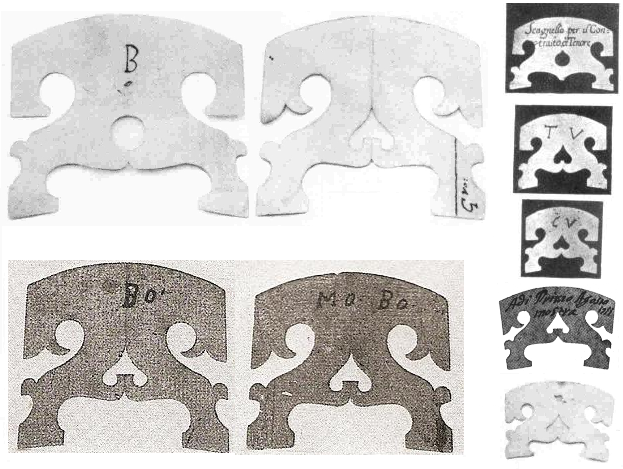 These are the Stradivari models of bridge that I could find. Four for cello, three for viola and two for violin. In this model for cello I've done some markings. 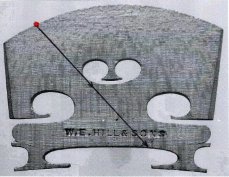 The red point represents one of the inner strings, say D, the second. The rings represent the waves coming from the string, propagating in all directions, as long as no surfaces are encountered: they are the addition of all the waves' trajectories in all directions. Then I have drawn a few of those waves: you can see how those waves rebound when encountering the surfaces of the bridge: wood to air all around it. One of those waves, a light blue one, will reach the ground of the right foot in a direct, undisturbed straight line. Though I haven't drawn them, mark that there is room for quite more waves reaching directly the ground of the feet. And mark also that the ground of the feet are solid to solid surfaces, wood to wood, surfaces that due to the close densities, most of the waves will cross. That's why it is indeed so important that the feet of the bridge are perfectly fitted to the front blade. 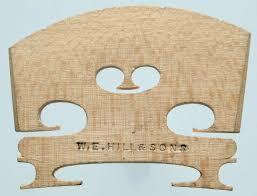 Otherwise, the surface wood to wood becomes smaller and fewer waves get into the instrument. Opposite to the baroque bridge, where a lot of the waves coming from the inner strings reach the ground of the feet directly, in this modern violin bridge you won't find a single one that does reach directly the feet of the bridge. The holes, especially the heart, are actually in the way of the waves to the feet. That's why I think modern bridges as closed and baroque bridges as open. Sometimes it happens that a modern bridge has high enough holes to allow the outer strings get some waves reaching directly the feet. Then chances are for the first string to sound too bright. See how different the feet of the modern and the baroque bridges are. Thick feet with wide ankles, open are the baroque ones. Thin with narrow ankles, closed modern feet. It is true that cello and double bass bridges have wide legs, but the direct way remains closed. I have already said that the heart of the modern bridge is in the way of the waves to the feet, while the hole/heart of the baroque one makes the way for them. If you take a baroque bridge with a hole and you turn the hole into a heart, the instrument will sound louder, maybe a bit darker and fore sure more robust. Without going too far, the bigger the heart becomes, the louder the instrument sounds. If you go too far you will start finding little difference between really very big and far too big a heart. Then there are the arms, and the lateral holes as the armpits. Only the viola models and one for cello have flat arms, while the models for violins and celli have arms with "fingers". Arms with fingers ask for heavier bowing, flat straight arms produce a clearer articulation with lighter bowing. Violas are heavier to play and articulate less easily than violins. Yet bridges with straight arms for the violas and arms with fingers for the violins get the matter in balance. 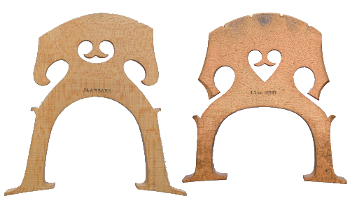 Then there is that cello bridge with a hole and straight arms... and yet with the surface under the hole/heart as it is in all those baroque models except for the lowest model for the violas. In this picture you can see all this: I've tried to draw more or less the same waves in both models of bridge. See what happens when they reach a hole and compare it with what happens when there is a heart instead of a hole. And see how that green wave rebounds immediately back when the arms are flat and what happens when the arm has fingers. The profile of the bridge i.e. the shape of the bridge seen from the side, is also very important. The best bridges, in my opinion, are those with a profile in wedge form, with straight back and front. Opening straight lines indeed, very good to send waves down to the feet of the bridge. Some bridges are made with a belly: the front is curved on the superior part and at a certain point it becomes parallel to the back, making a convex surface for us but concave for the waves, which makes them take a much longer trajectory in their way to the feet. As a result the articulation is not very clear and it demands pretty much weight from the right hand, becoming the instrument hard to play. When I asked about the reason to make a bridge with such profile I got to hear that so lives a bridge longer, because it stays straight longer. Here are the two real baroque bridges I have seen compared to their model. Both made of flamed maple. These bridges have suffered quite a lot in their life, but you do not need to pay much attention to see that they are pretty much what they are supposed to be according to the models. The first one is to see in the book "The 'Secrets' of Stradivari" by S. F. Sacconi, Libreria del Covegno, 1979. The second one, decorated, is the bridge of the Tuscan tenore. I went to the Musical Instruments Museum at the Accademia Gallery in Florence to see that instrument and its bridge. The profile of that bridge was indeed in wedge form, opening in an angle of about 5,5 degrees. Completely bent, though. 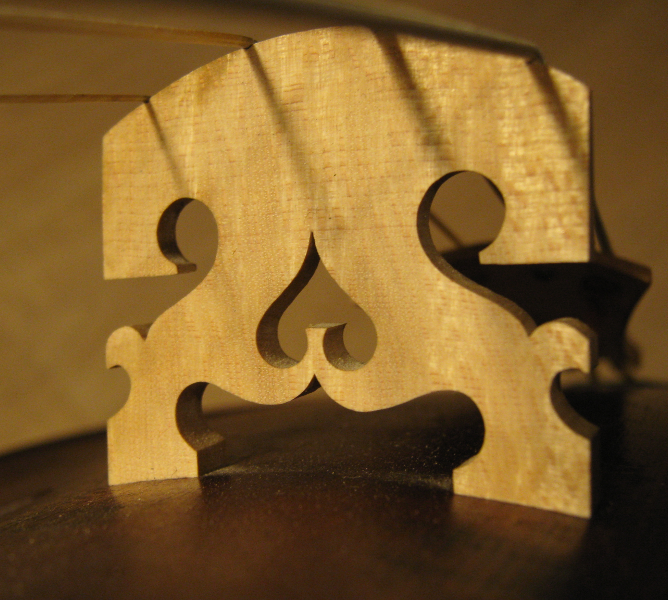 This is the bridge I have on my baroque viola. It works really very good. Even too good: it responds so well that actually my arm and my bow are far too heavy for it. I once played a modern cello mounted with a bridge in this manner with a very light early baroque violin bow. Obviously a cello is not supposed to be played with a very light violin bow, and yet it did feel very good in balance. That is so because modern and "baroque" instruments after the XIX century do not have blades with a thick middle part anymore. 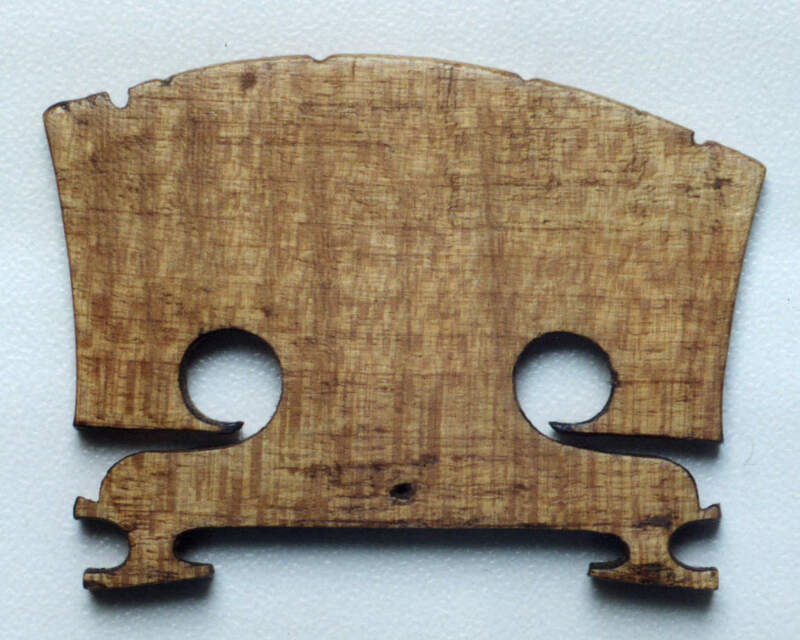 Baroque instruments did have such thick blades before being transformed, which brings in balance the response of the instrument with the weight of the bow and the arm of the player. The strength of the waves that these bridges bring to the instrument are somewhat too much for the thin blades of the instruments of nowadays. 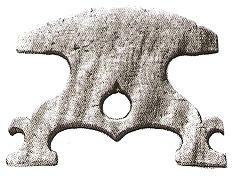 In the page about Jakob Stainer I speak about those thick blades of the ancient instruments. 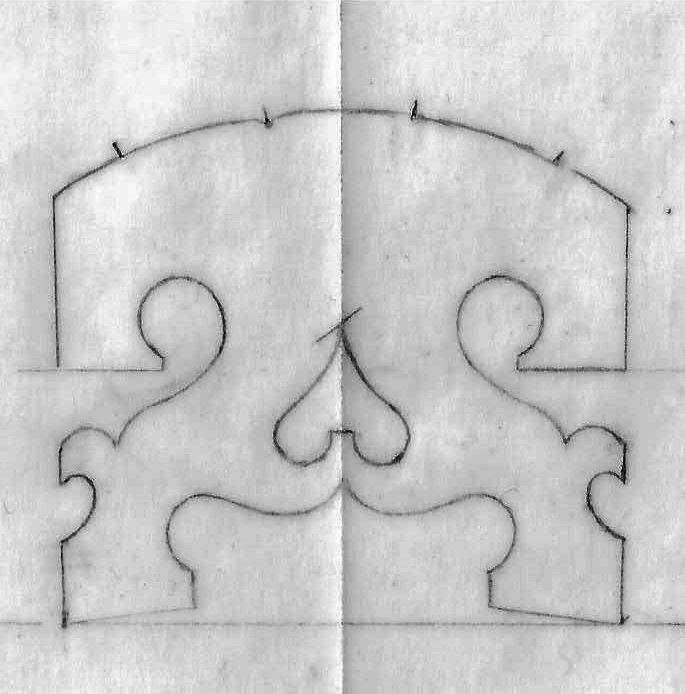 It has no heart, and therefore is it pretty open: both E and G have waves reaching the feet, however A and D don't. The little hole under the absent heart makes sense to me: in order to break the flat surface under it, where most of the waves would rebound back. It is also placed low enough to not disturb waves reaching the feet having rebound on the armpits, both directly from the strings or waves having rebound first on the straight surface between the feet. Feet of a modern bridge. And made of flamed maple. This sort of wood was before used instead of stripped maple, which has no flames. Flamed maple produces a darker sound, allowing the bridge to be of a regular thickness without sounding too sharp. Open bridges made of stripped maple tend to sound quite bright.